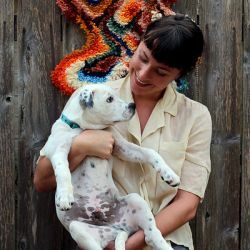 Free Creatures owner Marisa is a multifaceted artist based in Eugene, Oregon. Her designs are inspired by the natural world of the wild Pacific Northwest with a bit of art nouveau influence. Marisa specialize in all sizes of wall hangings as well as wedding pieces/altars. When creating a custom piece it is usually based on the look of a previously completed hanging that the client is attracted to. The production process is fairly quick once she gets started, and averages around 2-4 days (depending on the size). All of the drift wood used is eco-friendly and found in a national park located around the majestic Cascade mountain range. Marisa prefers to use organic materials such as 100% cotton rope, untreated wood and rough, semi-precious gemstones and minerals.